May 27. 2017 (San Diego) - A new study, which uses an advanced weather modeling program called HYSPLIT, developed by NOAA, the National Oceanic and Atmospheric Administration, shows that a radiation plume from a spent fuel disaster would affect as many as 18.1 million people who could be harmed and displaced by a nuclear disaster involving spent nuclear fuel. According to the article the NRC uses an inferior predictive model called MACCS2 that fails to accurately account for changing wind and weather patterns. 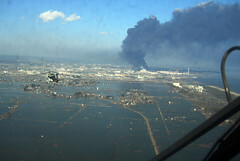 The ship has been deployed to assist in relief efforts following the devastating earthquake and tsunami, which has left an estimated 10,000 dead and many more missing in Japan.